When Dartmouth’s Triathlon Club was founded five years ago by Kendall Farnham ’14, Sara Heard ’15 and Nicolina Mascia ’15., the group of students wanted to fill the void for athletes who wish to expand to multiple sports. Over the course of the last four millennia, sports have served as an integral part of the human experience. Brian McLaughlin ’18 has had a magnificent Dartmouth career and is a veteran member of the varsity alpine ski team. Baseball Dartmouth baseball suffered a tough loss to Harvard University this past Monday. 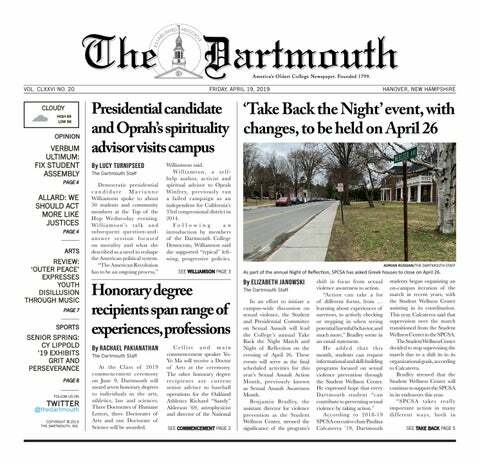 When the typical Dartmouth student thinks about the importance of athleticism in Dartmouth’s history, they may focus on annual traditions such as running around the Homecoming bonfire, diving into Occom Pond for the Polar Bear Plunge or hiking The Fifty. Over the past few weeks, Dartmouth’s athletic teams have been busy finalizing their rosters for the upcoming season, including the addition of the new recruits from the Class of 2022. Since 1877, rugby has been part of the College’s athletic landscape. The Dartmouth Rugby Football Association was founded in 1880 and later transitioned into traditional American football in the 1890s, but returned to the roots of the sport with the establishment of Dartmouth Rugby Football Club in 1951. In its history, the club has toured Argentina, Bermuda, Ireland, Italy, South Africa, Spain and Uruguay. During the end of April as the Ivy League was handing out their yearly distinctions, Jason Liu ’21 had the honor of being named Rookie of the Year in men’s golf. Women's Track and Field: The Dartmouth women’s track & field team finished in second place after two days of competition in the 2018 New England Outdoor Championship at Memorial Field. Micah Schroder ’20, second baseman for the softball team, was named to the All-Ivy second team after a stellar season. On Apr. 30, Dartmouth Football announced that tri-captain and quarterback Jack Heneghan ’18 and safety Colin Boit ’18 were on their way from the Ivy League to the National Football League. Since 1977, the Dartmouth Ultimate Frisbee Team has been one-upping the rest of us by tossing around a disc on the Green. On Apr. 22, the Dartmouth tennis tam concluded its regular season after falling to Princeton University, finishing with a 4-3 mark in the Ivy League to tie for third in the Ivies. Dartmouth’s men’s track and field team placed fourth overall in the Ivy League Heptagonal Outdoor Track & Field Championship at the University of Pennsylvania’s Franklin Field. Abigail Chiu ’21 has made an immediate impact on the Dartmouth women’s tennis team since joining the team this past fall. Football Name: Caroline Allen ’20 For how long have you managed the football team? I started managing last spring, so my freshman spring, and I’ve been doing it ever since. Why did you apply? I want to work in sports when I’m older so I thought it was a good opening opportunity, but I also applied to football specifically because I really like football and I knew they had a really good community and that it was a great team to be a part of. What are your responsibilities on the team? I film games and practices, so I help set up before practices, and then I also travel with the team. While baseball co-captain Dustin Shirley ’18 has filled the stat sheet and impressed with his sheer athleticism in his time at Dartmouth, his impact off the field and his journey to get there reflect an intriguing story as well.